Google Insights is a new tool from Google that really surpasses the keyword tool in some areas. Where the keyword will suggest many different possibilities that will narrow the keywords you are targeting Insights will only give you the top 10. However where it has significant advantages is its geographic targeting. For example you can pick Australia or a state (unlike the keyword tool where you can only pick the country). If you do pick Australia it will break down search volumes by state so you can get some idea of where you should target, or even where you need to set up your distribution centre. 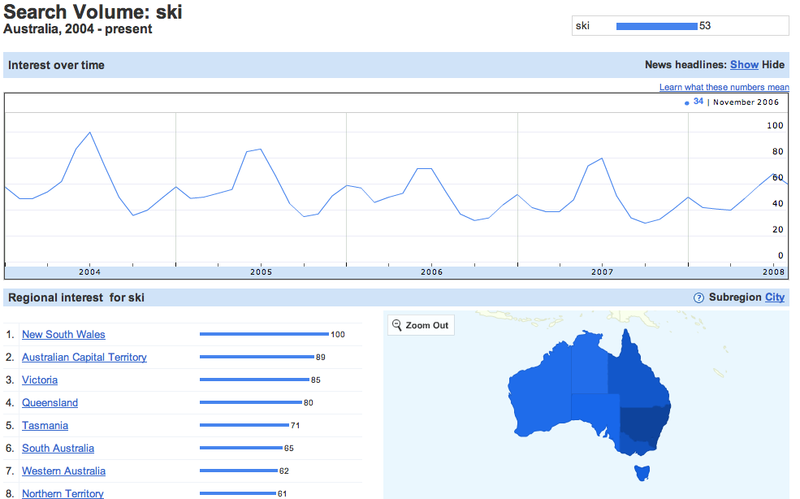 The other area that is useful is that you get a graph going back to 2004 that shows searches per month. This gives you a great idea on what is happening over time, whether there are seasonal variations and even whether you are about to enter an increasing or decreasing market. One thing to note is that get numbers to show on the graphs, you will need to have a Google account. You can get one of these by signing up to Gmail or many of the other Google services. However one word of caution is that these are not absolute numbers they are normalised against the highest figure (ie if the top search volume was 1000 and the months search was 700, the value would be 70[%]). So you would use this to look at your market trends over time where as the keyword tool would still be your primary research tool for looking which keywords and phrases to optimise for.